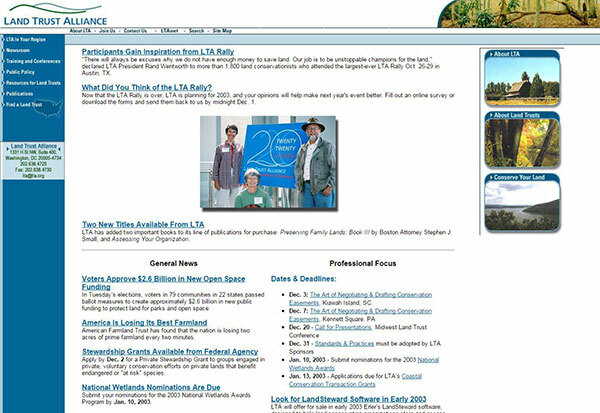 Welcome to the fourth major version of the Land Trust Alliance’s web presence! Our first major overhaul since 2008 introduces several improvements, including this new blog, The Dirt. But to fully appreciate all that has changed, join us in the Wayback Machine. Our website debuted in 1997, when dial-up Internet access was standard and we could still talk about Mother Teresa and Princess Diana in the present tense. While light on information compared to later incarnations, Version 1.0 nonetheless provided great value. It offered an “essential library of information on land trusts,” the latest public policy news and “guidelines for operating land trusts legally, ethically, and in the public interest.” Because if you’re gonna do it, you should do it right. We were eagerly awaiting “Harry Potter and the Order of the Phoenix” when our website’s second incarnation magically appeared in 2001. The more robust Version 2.0 established a new standard and launched the Find a Land Trust function that helps connect people to conservation teams nearest them. This version continued to use photos and images sparingly to avoid choking limited Internet connections. It was Version 3.0 that opened the information floodgates. Coming online in 2008, the year we saw 43 world records set at the Summer Olympics, this website established a framework that would last into 2015. Vast amounts of information were made available as the website grew into an era boasting high-speed Internet connections. And while this approach was undertaken with the best of intentions, it eventually yielded a website that became increasingly difficult to navigate. Refinements were needed. That’s why our newly launched Version 4.0 features so many visual and functional changes. This cleaner presentation offers more intuitive navigation; a stronger focus on storytelling; a dynamically adaptive design that looks great both on laptops and smartphones; clearer markings of resources; and a blog to curate news, opportunities and insights from the Alliance. More changes are coming, including an update to our land trust jobs board, but take a look now and let us know what you think!